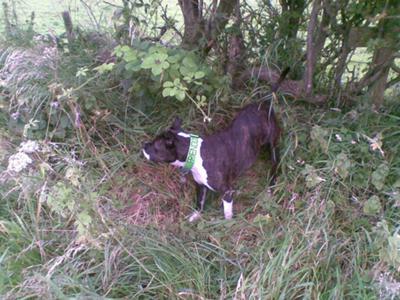 The picture I have submitted of my dog Cassie, a Staffordshire Bull Terrier, was snapped on a typical walk last year. She was sniffing the grass and generally investigating when all of a sudden she stopped what she was going. Her ears pricked up and her tail stiffened and raised up to a higher position than usual. She was staring ahead and she didn't move a muscle. I am no expert on dog body language. However I think her she heard something that was unfamiliar with, or perceived to be potentially threatening. She does the same thing in the house if she hears something or someone outside the front door. I think she is saying "I am intrigued and concerned about what I have just heard or saw, therefore I am assessing the situation before I decide what to do next". The outcomes are usually 2-fold. If she decides it is nothing to be concerned about, she resumes normal duties of sniffing and investigating. However, if she thinks there is a problem, she will bark at whatever it is, then turn to me and my partner and bark at us, wagging her tail in the process. I think this is her warning us "I have assessed the situation and I am concerned enough to tell you, as leader of my pack, about it". If we are not concerned (and we usually are not) we will tell her what it is and there is nothing to be worried about - in that childish baby talk tone we all use with dogs :). She will eventually accept there is nothing of concern and resume normal duties. She looks and sounds fierce, but is really soft, and she is scared of her own shadow. The friendly collar is a bit of a give away. The worst she would do to anyone is lick them to death. However an intruder wouldn't know this!